I started Ashford University in January 2013. I received a Bachelor's in Health Care Administration in February 2017. I am almost finished with my Master's at this time. It should be completed by November 2018. 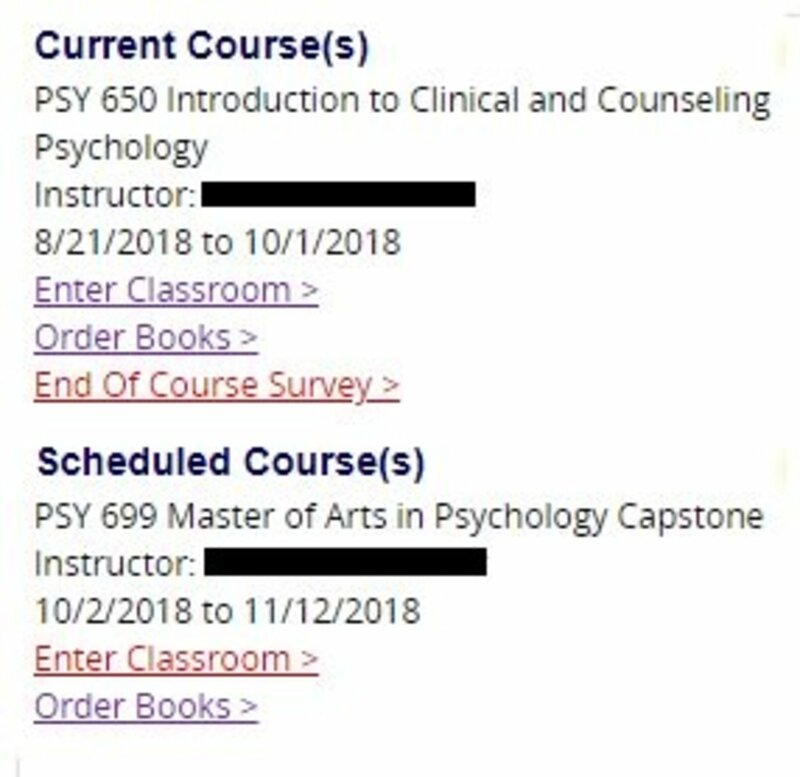 My Master's is in Psychology, and I started it in June 2017. For my bachelor's my minor was in Human Resources Management, and my Specialization was in Project Management. The reason why I went with Ashford University is that I was a divorced, jaded, 26-year-old single mother leaving a failed relationship. Due to a terrible, constricting marriage that failed in 2011, I had a limited job experience history and only a year of education as a pharmacy technician. Even that technical school for pharmacy technicians was a sham, as those credits couldn't transfer to any other institution, and it was quite expensive, but that's another story. This story is about Ashford University, and the ups and downs I experienced, and if I felt if the experience was worth it. In the beginning, the scary part about Ashford University was the 'unknown.' What is an online university like? Is this some scam? Is this university even accredited, and if so, by whom? Do "respected" schools accept credits from Ashford? What if I can't finish...will I be stuck with this massive bill? Will it be too hard for me? I had a million questions. I talked to a 'counselor' on the phone. He was accommodating. They have you fill out a questionnaire online after you make an account, and the questionnaire pretty much enrolls you in the program. (So be careful what you electronically sign and say 'yes' to if you speak to a counselor over the phone). I was ready and desperate to enter college because I wanted my life to change. I wanted to have options. I wanted to be my own woman. I wanted to own my education. I wanted to expand minds. I wanted to be a good example to my children somehow. 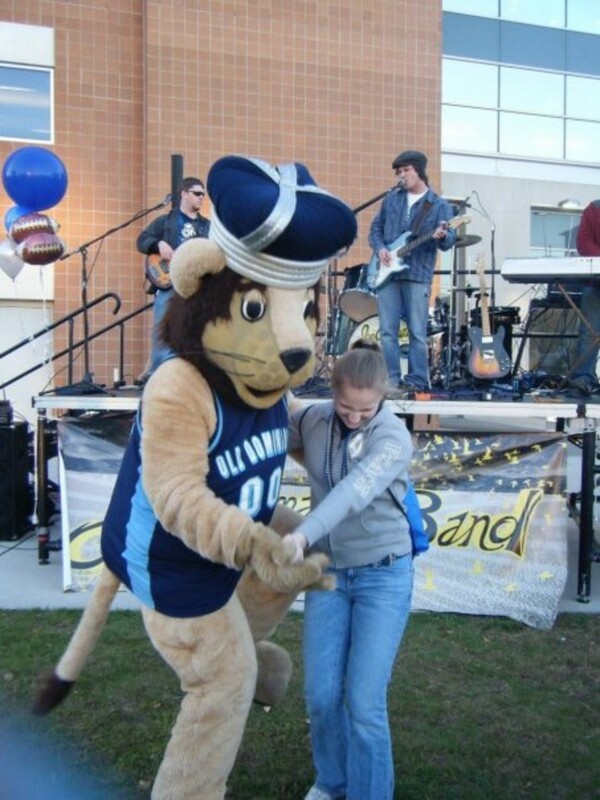 The process to join college is fast...a little 'too' fast....(enter suspicious music here). The classes are taken back to back, and there's not much of a break except for Christmas break. For a few weeks in December, you don't have to turn any work in, and it's amazing. A class may Start on August 21 and then end on October 1st. A class may begin on October 2nd and then end on November 12. Some classes will have the reading material electronically provided. Other classes will require you to order the books. All discussions have to be turned on Thursdays. Sometimes quizzes are required to turn in on Sunday. And assignments are due on Monday. You can procrastinate, but that will cause a huge amount of stress. It's better to spread out the homework and to read throughout the week to avoid the 'panic mode' that happens when you have a final to turn in on a Monday night. 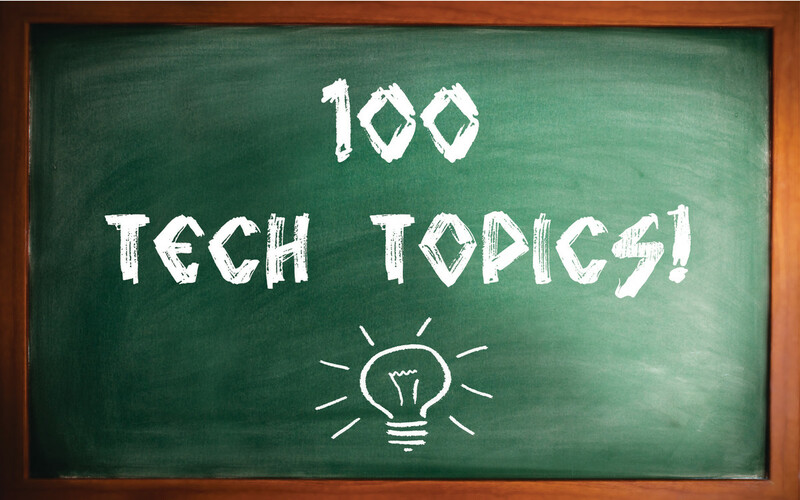 For discussions, you will ususually be assigned one or two discussions. They are questions that a teacher asks you based on your personal opinion, research, and a video or reading that they recommended for you to read or watch. Usually, they need to be 250 words or more, dependong on the teacher. Assignments are usually either two to ten pages long and have to be double-spaced, and in APA format with supportive research (not, and never, Wikipedia). For your information, Ashford is accredited by the WASC Senior College and University Commission. Ashford Started off as a school for girls in 1893 in Clinton, Iowa. The original building was built in 1910 and was used for college purposes until 2016. The college was accredited with the name Mount St. Clare College. In 2003, the name was changed to The Franciscan University. In 2004, the name changed to The Franciscan University o the Prairies. Because of money issues, the school as bought by Bridgepoint Education in March 2005 and then renamed Ashford University. In June 2010 and 2012, the regional accreditation with the Western Association o Schools and Colleges (WASC) was denied due to high dropout rates, lack of academic rigor, and a general understaffing of full-time faculty members. It was finally approved for accreditation through WASC in 2013. On May 2016, the Clinton, Iowa campus was closed, completely, because it could not meet enrollment requirements. At this time, as of November 2018, the college is looking at large challenges ahead, even the loss of GI Bill funding. Bridgepoint Education, who bought out the college as mentioned, is thinking of merging with the school called University of the Rockies and transforming Ashford into a nonprofit university. From 2011, Ashford University's enrollment has plummeted by fifty percent. Ashford University graduation and retention rates are low. The US Department of Education scorecard shows that this college has a sixteen percent graduation rate, and only about twenty-three percent pay back the student loans. 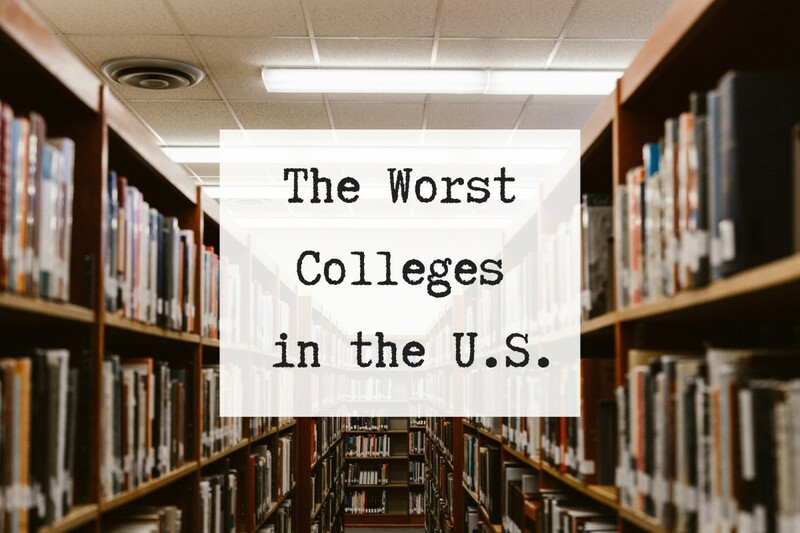 There is a long list of lawsuits and controversies surrounding the school, ranging from robocalling to unlawful marketing, to VA benefit reliability, political moves to regain GI Bill funding, and even to even a recent 2017 lawsuit unlawful debt collection practices. My counselors changed quite a bit through the course of my school years. One counselor messed up my bachelor's requirements, and I had to pay about $1500 for an extra class that was added last minute when I decided upon my Specialization and Minor. My transcript was actually 'held hostage' until I paid the full amount. I had some teachers that were extremely condescending and rude. It's hard to believe, but some teachers can be bullies in an online environment. All teachers have different standards of course, and all teachers expect you to follow APA format, but some are more strict than others. 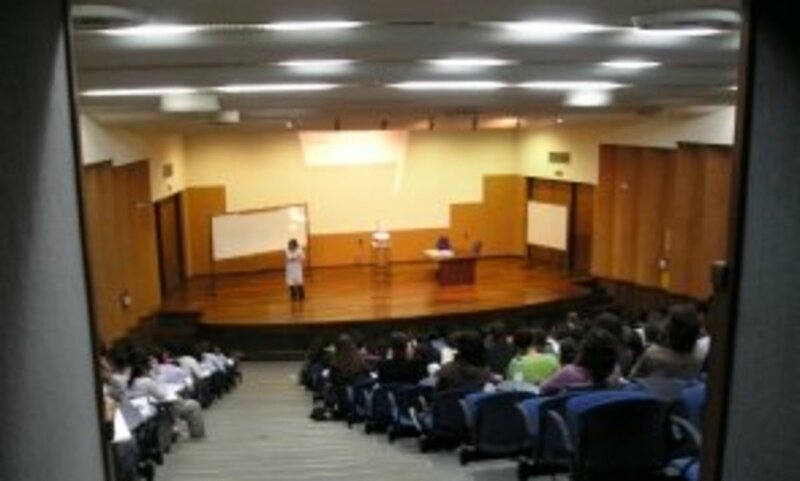 A respected Master's degree in Psychology is accredited by the APA or American Psychological Association. Ashford's psychology Master's degree is not, so that may potentially be a problem in my near future, especially if I ever to get a psychology license. There is a chance I may not be able to in Texas since the college is not APA accredited. 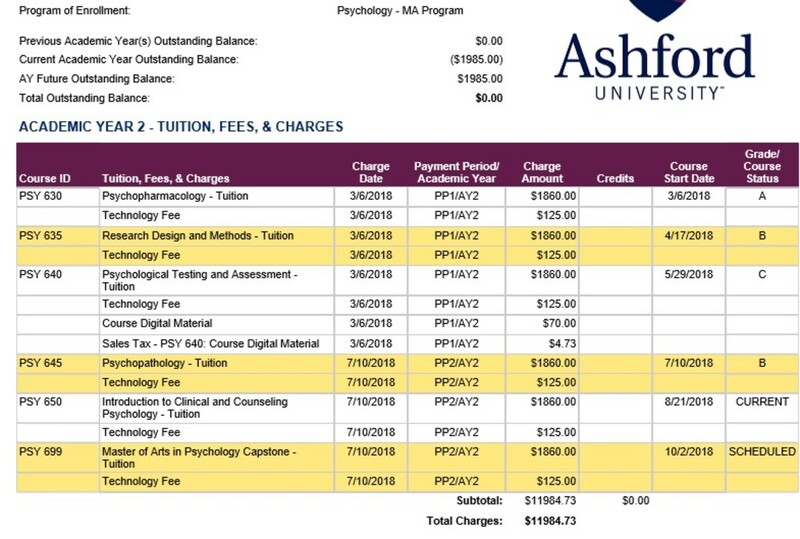 Since Ashford's master's degree in psychology program is not accredited, that means that the programs' curriculum is inconsistent with the standards that the APA requires. Please note, that at this time, there are no APA accredited programs that are available ONLY online. Ultimately, even with two kids, and even with three years of working 40-60 hours per week, I was able to get my degree. Even through vacations, breakups and a few moves, as long as I had Wifi, I was able to log in, turn in my assignments, and get a grade, even if it wasn't my best effort, but anything was better than a zero. Attendance is important, and attendance can affect the loans, stipends, and grades so make sure to turn in your discussions on Thursdays, quizzes on Sundays, and those larger assignments on Mondays. I completely regret how much I have to owe back. The average cost of a Master's degree is about $40,000, and the average cost of a bachelor's degree program is about $8,800 for in-state students and $25,620 for out of state students. Since I am in Texas, I suppose I'm considered out of state. Ashford started off in Clinton, Iowa, but that campus mysteriously closed down recently. And now, my education is based out of campus in California. I am probably not going to the graduation. I will receive my degree in the mail and probably cry over my student loans. 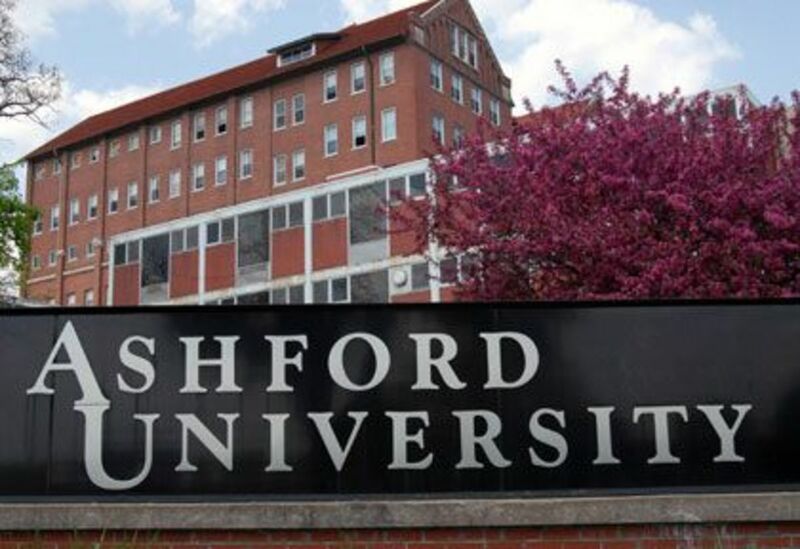 In the end, I feel I can't recommend Ashford University due to the high cost of attendance, sudden changes (like losing the Iowa campus), lack of proper accreditation, high levels of controversies/lawsuits, and high rate of dropouts. At this time, I can not recommend Ashford University to you. 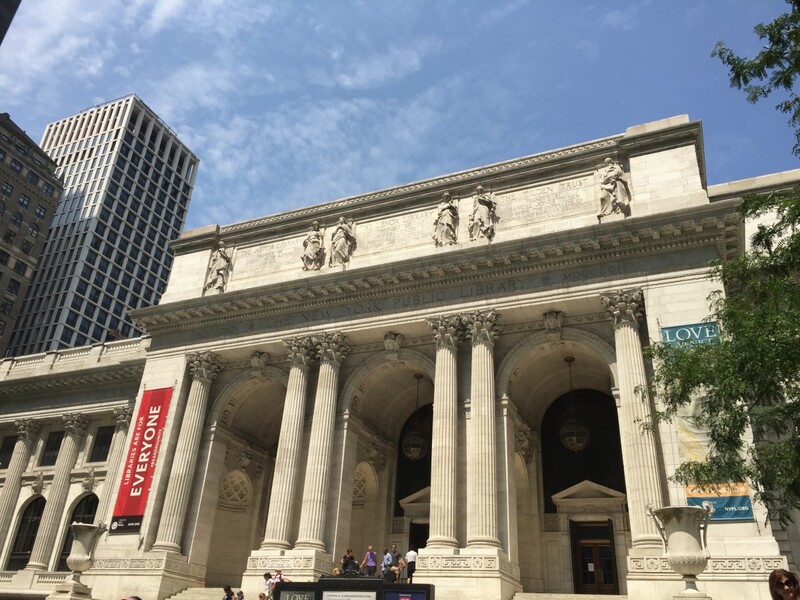 While I did learn quite a bit through the classes, and many were challenging, and I became proficient at writing papers and APA formatting, the cost is too high, and the inconsistency of the college was too much as well.